The effects of trade, or more broadly of globalisation, on incomes and their distribution in the rich countries have been much studied, beginning with a number of works on wage distributions in the 1990s, to more recent papers on the effects of globalisation on the labour share (Karabarbounis and Neiman 2013, Elsby et al. 2013), wage inequality (Ebenstein et al. 2015), and routine middle class jobs (Autor and Dorn 2010). In joint work with Christoph Lakner (Lakner and Milanovic 2015) and in a recently published book, Global Inequality: A New Approach for the Age of Globalization (Milanovic 2016), I take a different approach of looking at real incomes across the world population. This is made possible thanks to the data from almost 600 household surveys from approximately 120 countries in the world covering more than 90% of the world population and 95% of global GDP. Since household surveys are not available for all countries annually, the data are ‘centred’ on benchmark years, at five-year intervals, starting with 1988 and ending in 2008. I report the results for up to 2011 in Milanovic (2016), while Lakner has an unpublished update for 2013. The updates confirm, or reinforce, the key findings for 1988-2008 that I discuss here. The advantage of a global approach resides in its comprehensiveness and the ability to observe and analyse the effects of globalisation in many parts of the world and on many parts of the global income distribution. While the true or putative effects of globalisation on working class incomes in the rich world have become the object of fierce political battles – especially in the wake of the Brexit vote and the rise of Donald Trump to political prominence in the US – the overall effects of globalisation on the rest of the world have received less attention, and when they have, were studied separately, as if independent, from the effects observed in the rich word. 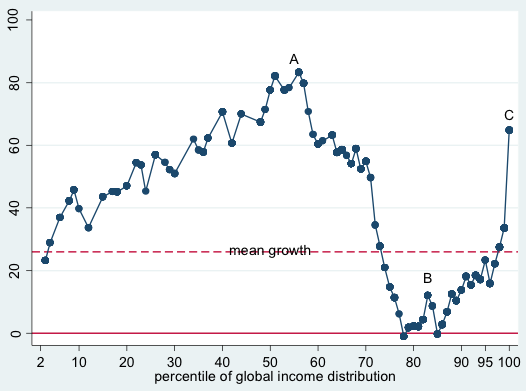 Figure 1 – dubbed by some ‘the elephant graph’ because of its shape – shows real income gains realised at different percentiles of the global income distribution between 1988 and 2008. Income is measured in 2005 international dollars and individuals are ranked by their real household per capita income. The results show large real income gains made by the people around the global median (point A) and by those who are part of the global top 1% (point C). It also shows an absence of real income growth for the people around the 80-85th percentile of the global distribution (point B). Who are the people at these three key points? Nine out of ten people around the global median are from Asian countries, mostly from China and India. Their gains are not surprising, given that Chinese and Indian GDP per capita has increased by 5.6 and 2.3 times, respectively, over the period. Thus, for example, the person at the median of the Chinese urban distribution in 1988 was then also at the global median, but rose to the 63rd global percentile in 2008 and was above the 70th percentile in 2011. She thus leapfrogged, in terms of income, some 1.5 billion individuals. Such dramatic changes in relative income positions, over a rather short time period, have not occurred since the Industrial Revolution two centuries ago. The people around the global median are, however, still relatively poor by Western standards. This emerging ‘global middle class’ is composed of individuals with household per capita incomes of between 5 and 15 international dollars per day. To put these numbers into perspective, one should recall that the national poverty lines in rich countries are often higher than 15 dollars per person per day. The global top 1% is composed overwhelmingly of the people from the advanced economies – one half of the people in that group are Americans, or differently put, 12% of Americans are part of the global top 1%. China and India have many billionaires (in effect, according to the 2015 Forbes list, China and India have more than 300 billionaires versus more than 500 for the US), but compared to the ‘old rich’ world, Asian countries still do not have sufficient numbers of ‘comfortably rich’ or affluent households. In 2008, the threshold for being in the global top 1% was 45,000 international dollars per person per year which, translated into a traditional family structure of two partners and two children, implies an after-tax income of $180,000 (or, using the approximate tax rates of the rich countries, a before-tax income of more than $300,000). The contrast between the unambiguous success of people at point A and the relative failure of people at point B allows us to look at the effects of globalisation more broadly. Not only can we see them more clearly when thus juxtaposed, but it enables us to ask whether the two points are in some sense related: is the absence of growth among lower middle classes of the rich world the ‘cost’ paid for the high income gains of the national middle classes in Asia? It is unlikely that one can provide a definitive answer to that question, since establishing causality between such complex phenomena that are also affected by a host of other variables is very difficult and perhaps impossible. However, the temporal coincidence of the two developments and the plausible narratives linking them, whether made by economists or by politicians, make the correlation in many people’s mind appear real. In addition to looking at the global reshuffle of income through the nation-state lenses (are the ‘losses’ of UK working class related to the gains of the Chinese? ), we can look at it through a purely cosmopolitan lens where all individuals are treated equally, and the same-percentage income gains realised by the poorer people are valued more than those made by the rich. With such a perspective in mind, it would be hard to dismiss the period 1988-2008 (and as our results for up to 2013 confirm, the period all the way to the present) as being one of failure. One could, despite the rising income share of the global top 1%, argue the opposite by pointing to the close to doubling of real incomes realised by some one-fifth of the world population that lies between the 45th and 65th global percentiles. It is their real income growth that has driven the first decline in global inequality since the Industrial Revolution (Milanovic 2016, Chapter 1). The issue, however, is that such a cosmopolitan approach is a very abstract way to look at the matters of distribution. Most people are concerned with their incomes as compared to their national peers. Milanovic and Roemer (2016) show that what seems a very positive development (that is, lower global inequality) when individuals are assumed to be concerned solely with their absolute incomes becomes much less positive when we also include in their welfare functions a concern with relative positions in national income distributions. Then the dominant feeling across the world, reflecting increasing national income inequalities, becomes one of a relative loss. The political implications of a global ‘elephant graph’ are being played out in national political spaces. In that space, rising national inequalities, despite being accompanied by lower global poverty and inequality, may turn out to be difficult to manage politically. Autor, D. and D. Dorn (2010), “The growth of low-skill service jobs and the polarization of US labor market”, American Economic Review 103(5): 1553-97. Ebenstein, A., A. Harrison, M. McMillan and S. Phillips (2014), “Estimating the Impact of Trade and Offshoring on American Workers Using the Current Population Surveys”, Review of Economics and Statistics 96(4): 581–595. Elsby, M. W. L., B. Hobijn, and A. Şahin (2013), “The Decline of US Labor Share” paper prepared for the Brookings Panel on Economic Activity, September 2013. Karabarbounis, L. and B. Neiman (2013), “The Global Decline of the Labor Share”, Quarterly Journal of Economics 129(1): 61–103. Lakner, C. and B. Milanovic (2015), “Global income distribution: from the fall of the Berlin Wall to the Great Recession”, World Bank Economic Review 30(2): 203-232. Milanovic, B. and J. Roemer (2016), “Interaction of global and national income inequalities”, Journal of Globalization and Development, forthcoming.